Are you planning to revamp your kitchen cabinets with vibrant shades or want to give a unique yet sophisticated look? Gone is the time when people used to consider plain and simple cabinets. With innovations in styles and designs of kitchen cabinets, a myriad of bold to vibrant and sophisticated colors have become the need of ever modern kitchen. From those retro hues to vintage look, and colors ranging from brown, cream, red to silver, beige, orange, fluorescent green, black and even white have become a lot popular. Colorful kitchen cabinets today have topped the list in the trendiest designs of 2014. Well, the number of shades you can pick up for your modern kitchen cabinets is endless. Still, you can streamline your research by implementing certain parameters. For instance, you can keep the current same and get the color combinations different. Violets and purples have been in vogue in the last couple of years, and most of the kitchen designs firms recommend these designs to homeowners as their popularity is likely to rise in the years to come as well. Shades of purple look absolutely stunning with any type of kitchen setting and that instantly gives the visual richness desired in that room. You can also move from fashionably brighter shades to the hottest shades such as grey. While many homeowners consider grey as a dull color for their kitchen, grey in combinations with red or black would add all the difference. The grey color blended with vibrant colors such as orange and blue would look warmer and sophisticated. You will find style and elegance with grey cabinets when they will be matched with the brighter shades. Jet black is one color, which can never fade away with time and adds to class in a kitchen room. Black cabinets with glass doors bring all the sophistication and style you want to bring to your modern kitchen decors. Bronze or copper knobs will further enhance the modern touch. If you want your kitchen to look bright and naturally appealing, then the sunny yellow blended with orange will make a perfect combination. By coating your kitchen cabinets in bright yellow or orange, and a touch of white, would certainly bring the charm you need in your cooking space. The colors will also enhance your cooking interest and experience. Red rose color not only makes a bedroom look romantic but can also add warmth to your kitchen area. 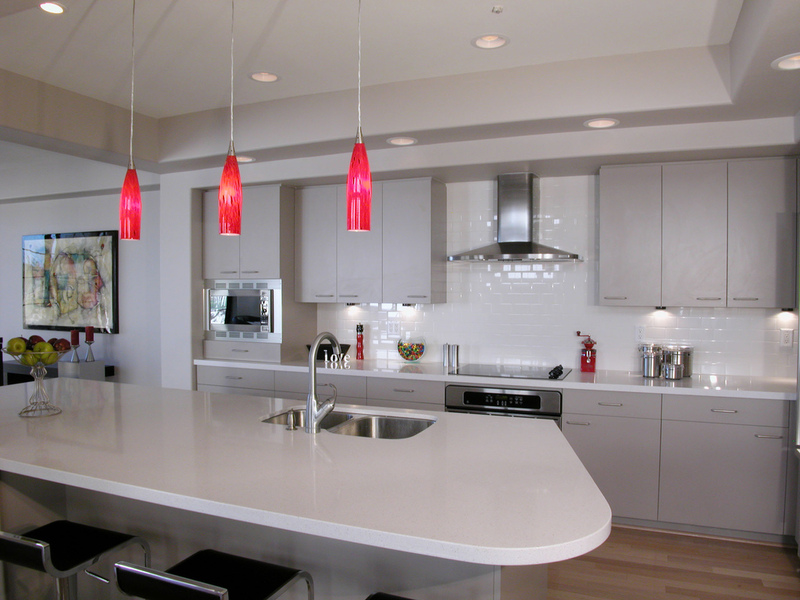 Rose red cabinets with a touch of white would provide a visual relief and some eye-catching attention. If you want to add a natural element to your modern kitchen, go for shades of natural tree green color. The soft color would look with a touch of brown on the edges or borders. Give it a jungle look by adding vibrant lighting fixtures too. With a myriad of color options to choose from, you can certainly bring the trendiest color style for your kitchen and make it a place of heaven.